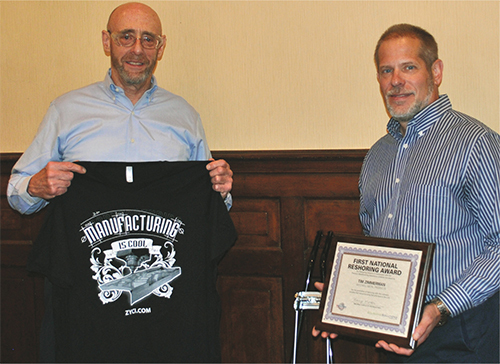 Harry Moser (left), founder and president of the Restoring Initiative, is shown with Tim Zimmerman, president of Mitchell Metal Products and recipient of the First National Reshoring Award. 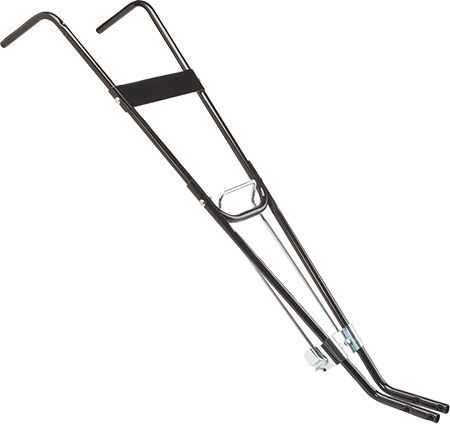 A reshored cultivator-handle subassembly in 2016 that went from 4500 made overseas to 30,000 made in Wisconsin is what gained Mitchell Metal Products the First National Reshoring Award. 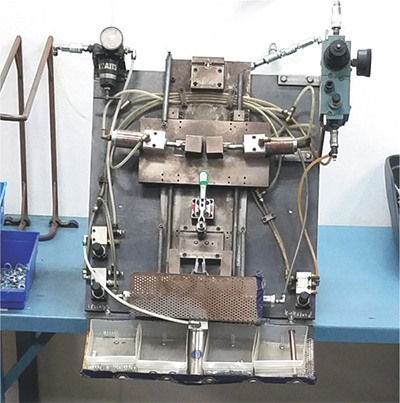 This semiautomatic assembly center, developed by the MMP tooling department, reduced cycle time from 3 min. to 75 sec. 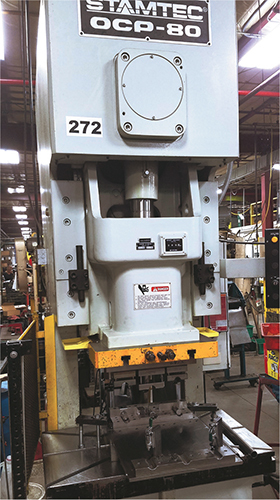 A Stamtec 30-ton secondary press, equipped with tooling designed and built by MMP, punches and fabricates the tubing. 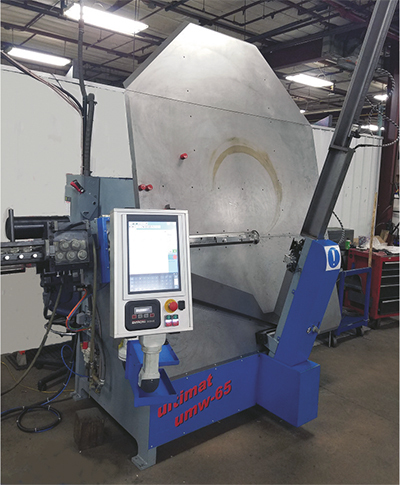 MMP employs this Ultimat UMW-65 two-axis PC-controlled wire-forming and welding machine to produce reshored parts. Twin 400-ton Blow servo-press lines stamp out subassembly parts. For the third consecutive year, the number of manufacturing jobs returning to the United States equaled or exceeded the number of jobs lost to offshoring. An important factor in reversing the decades-old trend is the Reshoring Initiative, founded in 2010 by Harry Moser, retired president of machine-tool supplier GF AgieCharmilles. Moser’s organization assists companies with assessing their total cost of offshoring, and with efforts to shift collective thinking from offshoring is cheaper, to reshoring reduces the total cost of ownership. Recognizing that stellar efforts to bring back jobs deserve recognition, the Reshoring Initiative, in conjunction with the Precision Metalforming Association (PMA), announced the winner of its First National Reshoring Award: Mitchell Metal Products (MMP), Merrill, WI, a company that, since the early 1990s, has been reshoring products for its customers. One of Mitchell’s most recent successes—a reshored cultivator-handle subassembly that in 2016 went from 4500/yr. made overseas to 30,000/yr. made in Wisconsin—gained MMP the award. The product is made using 13-gauge cold-rolled steel; 14-gauge electro-welded tubing with an 0.75-in. OD; and a type 1018 commercial-quality 000-gauge wire. 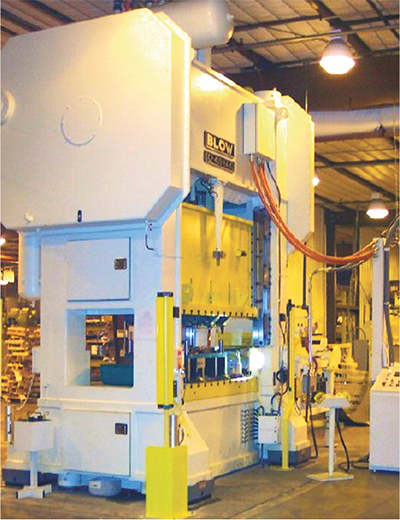 Equipment used to make the part includes: twin 400-ton Blow servo-press lines for the stampings; a Minster 70-ton open-back inclinable press for tube fabrication using custom tooling by MMP; a Stamtec OCP-80 30-ton secondary press, equipped with MMP-designed and -built tooling that punches and fabricates the tubing; a pneumatically controlled assembly station, designed and built by MMP; and an Ultimat UMW-65 2-axis PC-controlled wire-forming and welding machine, producing wire forms for the kickstand subassembly. “The bracket stamping for the kickstand is produced on an 11-station progressive tool,” explains Tim Zimmerman, MMP president. “The bracket is highly formed with close-tolerance extruded holes, which create the pivot point for the wire-formed support. Alignment of the holes, critical to function, is assured after extruding via use of side-cam punches in one of the final stations. And faster cycle time—from 3 min. before to 75 sec. now—was accomplished thanks to the efforts of our tooling department, which developed a semiautomatic assembly center that cut the kickstand assembly time in half. This proved to be a key innovation. “While our array of capabilities enabled us to handle this project, we also have a great network of contractors contributing to our success,” continues Zimmerman. “For example, while much of the tube bending for this project is performed here, there is one bend that we knew could be cost-effectively performed by one of our subcontractors. Internal processes for this project include progressive metal stamping, tube bending and fabrication. Two important keys allowing MMP to capture this project include a talented internal tooling department that produces 95 percent of the tooling used by the company, and production control and purchasing management, which work closely with MMP’s suppliers and subcontractors to ensure adherance to quality and on-time delivery expectations. Zimmerman says that MMP achieved stellar quality, less than a 0.002-percent non-conformance rate, and a 99.8-percent on-time-delivery rate, adding that several factors will continue to strengthen the reshoring trend, with the most important being reliable supply. Others include the ability to respond quickly to changes in the market, product quality, attractive total purchase cost, ability of domestic sources to collaborate on designs and redesign options, and competitive piece-price comparison. The 2018 award will be presented at Sourcing Solutions next fall. The deadline for applications is September 1, 2018. For details and an application, visit www.pma.org/sourcingsolutions.